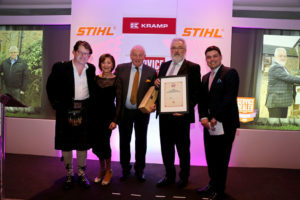 Patrick Vives was awarded the outstanding contribution award at the Service Dealer Awards last week, which was held at the Belfry Hotel in Oxfordshire. After 40 years of employment, Patrick retired from his position of President of Etesia SAS earlier this year. He has been hugely instrumental in helping Etesia achieve global success and continues as an ambassador and consultant for the company. “Originally we started by trying to sell the products from France and we spent two years without selling a single mower,” reflects Patrick. “I went to the shareholders even though we hadn’t sold anything and told them I wanted them to spend more money! We needed to establish a presence in the UK and hire UK people. That’s what happened and we built it up slowly from there. The Service Dealer annual conference and awards, first presented in 2003, is always an important date in the industry diary. It gives an opportunity to network, share stories, discuss business challenges and most of all share a fun evening with each other. According to the magazine they received more nominations than ever for the awards across all of the categories. Etesia UK continues to grow with an expanding list of dealers promoting the Etesia and Pellenc brands across the UK and Ireland.